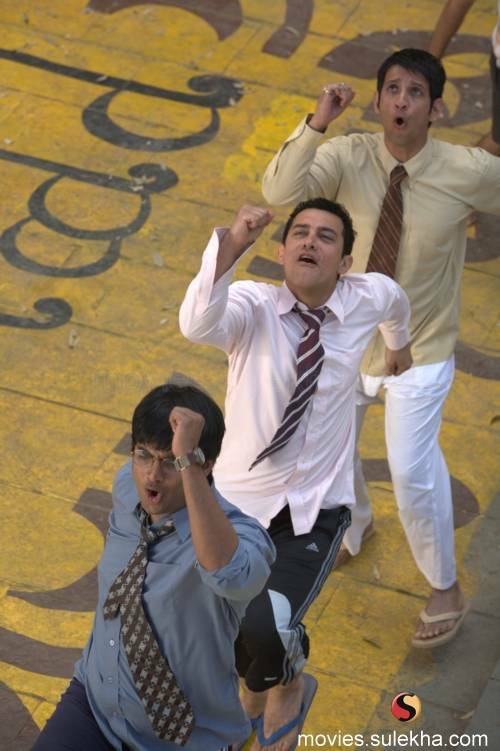 3 Idiots is a movie with a message like all Amir Khan movies.”Strive for excellence and success will follow”, that’s the motto of the movie.It also addresses the current trend of parents pressuring the child to become engineer or doctor without enquiring about the child’s interest.Its amazing how Amir Khan easily essayed the role of a college boy making us wonder if he drinks some elixir of youth. The story begins with Madhavan receiving a phone call which makes him fake a heart attack to get off his aeroplane which just took off. He then picks up Sharman Joshi and they rush to their old college roof top to meet their old buddy Rancho (Amir) who went missing on the last day of college. However they are shocked to meet Chathur (Omi Vaidya) who had called them for this meeting claiming to have found Rancho. Its then a long journey the three of them undertake to find Rancho whose address Chathur managed to find out somehow. During the journey we are taken through a flashback depicting the first day of college. Madhavan’s dad declared he would become an engineer the moment he was born.He had far more interest in wildlife photography but his dad forces him to join Imperial College of Engineering.His room mate is Sharman Joshi, who is from a poor family and spends all his time in prayers begging for God’s grace.On that night their seniors start their ragging.Amidst all this hungama enters Amir Khan.He doesn’t obey the seniors and runs off to his room. The senior threatens to pee on his door if he doesn’t come out at the count of 5. Amir however extends a metal spoon tied to a wooden ruler, connected to a wire from a lamp and electrocutes the senior.He becomes a hero in the eyes of his two room mates Madhavan and Sharman. The movie then continues to depict Amir to be a brilliant student who has an undying hunger for knowledge.He was born to be an engineer.However he ends up on the wrong side of the teachers and Principal Viru Sahasrabudhi (also known as VIRUS). Virus continually makes life difficult for the trio. Meanwhile Amir befriends Kareena who happens to be Virus’s youngest daughter.The highlight is Chathur’s Annual day speech.Well you must actually see it to believe it. Its hilarious.The whole story is told with a lot of comical situations which will definitely make you laugh and laugh again.The climax of how finally Amir wins Virus’s respect and his true identity gets a little dragging but the exceptional performances of the entire cast makes up for this flaw. It is definitely a full family entertainer and i guarantee it will make you laugh and at the same time leave a lasting impression on your minds.